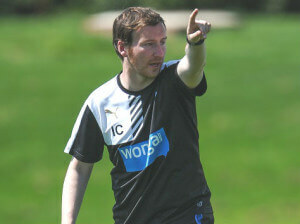 Ian Cathro is an even exciting appointment by Newcastle and we have high hopes that Ian will have new ideas in both training and how the team will play next season, and of course he comes to Newcastle very well respected in coaching circles and he’s still only 28. Ian is already known as a man who is a workaholic who seems to love coaching, and he’s made the point that football is not a 9-5 job and that you’re either in or you’re out. Steve McClaren has started off well at Newcastle inasmuch as he is willing to communicate with Newcastle fans and Steve did himself no harm on Monday night when he attended the Fans Forum meeting. The word coming from those who attended the meeting was that Steve was impressive, and he interacted with the fans representatives during the meeting – asking them questions so he was clear where they were coming from and what their concerns were. It looks like the training is going well at Newcastle since it started last Wednesday – a week ago – and Steve McClaren wasted no times in getting the lads out on the training field to so some ball work. Good words from Ian there – we already like him a lot. Newcastle will play their first pre-season game on Friday night against Gateshead at the International Stadium, and then the squad will jet out to America for their three game tour that will take place over the following 10 days. Here is Newcastle’s full pre-season schedule. If we could land Wijnaldum for £11.5m, then we will have done an impressive piece of business. It is hardly as though he is a “hidden gem”, and plenty of other clubs have been circling. I see Toby has signed for Spurs. When you think we were “in the lead” to get him all through last summer, up to and including deadline day, it would be a very pleasant day if Wijnaldum actually gets here. Yawney Yawney yawn yawn Munster lectures the ‘anti – pardew crowd’ saying cabaye going there would show how good a manager he was. The pull of palace is London and a guaranteed starting place not Pardew. Cabaye would struggle to get a regular game at most of the top half teams. We all know how easy upset and depressed Cabaye gets. It’s a easy ride he’s looking for. It’s a coup for Palace like, but could cause a bit of friction when he’s probably on double maybe treble what everybody else is earning. Ed – Not denying this new coach seems a good acquisition but every time someone new comes to the club and makes a statement you come out with your “They were good words from….” comment. I have to say you seem easy pleased and instantly impressed with a bit of well planned rhetoric. If you look back I wouldn’t be surprised that you have reported ‘good words’ on a number of duck egg individuals who have joined us over the years. Sorry Ed but wait awhile before being so hasty in your fulsome praise. Let them earn it first. There were certainly a number of “good words” from John when he took over. I f Cabaye signs for Palace it would indeed be a coup for King Percy. Cabaye picking a pass for their quick forwards would vastly improve their team. I think that they’ll finish above us this season. The only downside for me would be that the last remnants of that loon group – the Pro Percy Brigade (the Legion of Dishonor) would appear on the blog -crowing like foghorn leghorn – strutting around preening and crowing at full volume. Man I can put up with most things but not another bout of that rubbish. I dont like the sound of ‘we’ll know what we need when we get back’. They should know what they need from watching some games from last bloody season. I would imagine 100k a week will make life a wee bit easier for Cabaye ! As senior rooster ’round here, it’s my duty, and my pleasure, to instruct junior roosters (Mr Tuff) in the ancient art of roostery. Nice mannered kid, just a little on the dumb side. I say, boy, pay attention when I’m talkin’ to ya, boy – Pay attention, boy, I’m cuttin’ but you ain’t bleedin! I picked up on that to, problem is there’s only two weeks to the start of the season when they get back from USA. It’d be crazy to wait to sign players until they came back. op- at Newcastle the amount of time it takes to make a signing is not crazy….it’s called Standard Operating Procedure. Two weeks from now we will still be talking about identifying our needs, and identifying players to fill them, whilst mourning the fact that Wijnaldum has signed for Everton, Austin for CP, and Matip has signed a new deal at Schalke. Je suis d’accord que vous êtes un coq. That’s what we’re shaping up for I believe. Penfold was probably in the fetish clubs in Amsterdam, that’ll be the only business he was doing ! Typical Charnley – couldn’t even arrange a game in Raleigh NC! I can think of at least three Mags’d turn up to cheer the lads on. What Cathro was saying is ‘if you haven’t got the ball you goosed’. This means all will be expected to press and win it back, any who cannot be bothered to enter into hard work without the ball will be out, I expect Marvaeux, Vuckic, possibly Sissoko who lacks endurance may be on there way OUT, rather than IN. Cabaye to Palace smacks of a player who wants to be in the shop window for national team selection and loads of money living in London. He could have done a good job for us, but they do say never go back don’t they! At 29 he’ll be taking care not to get injured near internationals so Palace may not get 100% out of him. I think Palace will struggle next season because opposing teams will have a plan to stop their counter attacking style. For me Wijnaldum is a tremendous prospect!